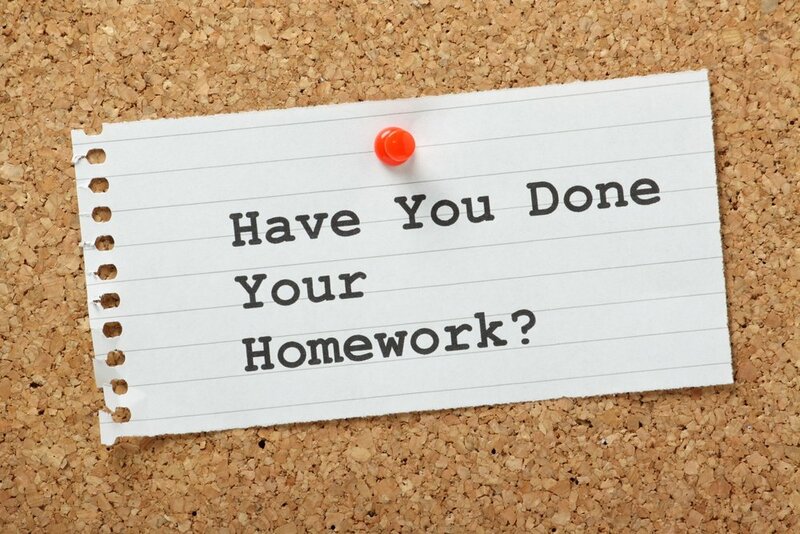 Getting your child to do their homework can be a lot like trying to pull teeth. There may be a whole lot of resistance from the child but be patient. Learning is about improving ourselves, and even children understand that. They are always going about learning new ways to make this easier, or more intriguing or most of all, fun! So let’s approach the process from that perspective, shall we? Children often feel a lot of pressure from adults and adults do not even realize when to pump the brakes a bit, but that is all a part of human nature. Children of course do need to be pressured, but in a positive way. What really works to motivate anyone is to show the short-term or long-term benefit to what it is that you are trying to accomplish. If you go in guns blazing trying to force pressure the child into learning the topic and you become frustrated, your child will in turn notice the negativity right away and begin to decide that they are being judged. They are right. So avoid this tactic. Try to be open and understanding of their own learning process. Explain the logic of math problems in a way that will show them those benefits, how math is all around us, whether we are gauging our speed driving to school, measuring ingredients for a delicious snack or meal or counting the school supplies that we need. Specific examples really help children appreciate why we need to understand the concepts in mathematics, even at a basic level. They will be more enthused by this method and seek new ways to solve problems with more advanced math. A lot of this is just all about attitude and mentality. Math is taught with great success in many Asian countries and many believe it is because of the way in which students learn the concepts and make the transition. It has been revealed that more visual representation matters to the student when discussing anything from simple basic addition/subtraction/multiplication/division to fractions and beyond. When they make a visual connection to the data, their brain can begin quickly deconstructing the logic behind the problem. Ask your child to work out the problem aloud with you so you know their line of reasoning as well. This will help you understand their approach so you can teach them some new tricks. Again, be patient. The respect factor is exponentially higher with children when you are on their level and are actually helpful in their eyes. You should also work problems out aloud with them and do the same with everyday scenarios in life as you are going along your day with your kids. Explain concepts in everyday tone and language and relate it back to those school math problems they were working on. 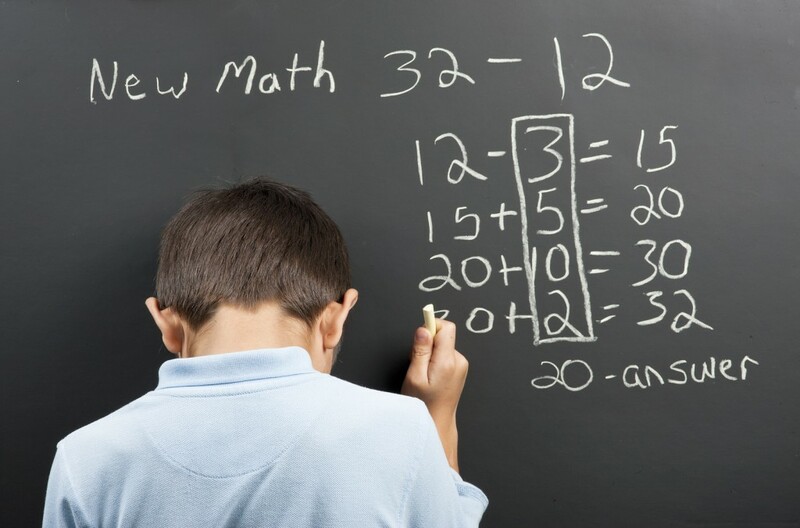 It may seem obvious that you need to be involved in your child’s education, but moreover, try to be involved in their actual math problems and other studies. Make it your problem too. They will be more studious when they feel it is a group activity or game. Make it fun for them if you can by creating mini milestones like a bonus fun game for every successful problem solved or for finishing their homework. Remember how flash cards worked? The more colorful the cards the better by the way. Being involved in all aspects of a child’s life is a great way to keep them involved in positive life activities as well. Your child will feel supported and confident knowing that their parents are there for them to help them when things get really tough. In math, when a problem is tough to understand, they may feel comfort in knowing that Mom or Dad can help guide them through it so they may understand it better. This helps a child’s confidence and self-esteem like no other. Children; just like pets, wild animals and grown adult humans; need to see the immediate benefits to the work behind learning a new skill, one that may seem mundane or useless in the form of numbers, symbols or expressions on a piece of paper or computer tablet screen. When your child solves a problem, be sure to remember to try to challenge them to think of a way that problem can be implemented in the real world, or even better their world! When the child begins to unravel mysteries, not only will it excite and motivate them, they will be rewarded with pride and wisdom. They are never too young to understand this! Get Access to free math lessons and math homework help online from basic math to algebra, geometry and beyond with the best online math tutors. Students, parents, teachers find these lesson plans to be very useful. Math is definitely challenging but what makes learning math fun and interesting is that, there are some tricks and techniques which can actually make the calculations easy to solve. Today, we will try to learn some math tricks which can be applied in solving different kinds of questions. We all know the 2 times table. But what if 2 is being multiplied to a bigger number, there is a trick to make the multiplication quick and accurate. Think about it, multiplying by 2 it is nothing but doubling the given quantity. So to speed the calculations the given number can be added twice instead of multiplying by 2. For example 6 x 2 = 12. This can also be got by 6 + 6 = 12. Now, if there is 32 x 2 = 64. This can also be got by 32 + 32 = 64. Now applying this trick to bigger numbers multiplied by 2. Find the value of 98340 x 2? Did you know 10 is a very interesting number when it comes to multiplication? For example, in a question you come across a calculation such as 23 x 10 all you need to do is place a one zero next to 23. That is 23 x 10 = 230. While multiplying, 45 and 50 one method would be the regular multiplication. By applying the trick here all that needs to be done is 45 x 50, first find the value of 45 x 5 = 225. Since there is 50 which is a multiple of 10 place a zero next to 225. Question: Sam brought 19 boxes of candies. Each box contains 200 candy bars, find the total number of candy bars in all the boxes. Number of boxes of candies Sam brought is 19. Each box contains 200 candy bars. Hence the total number of candy bars equal = 19 x 200. No matter what number is given to you multiplication with 11 can become quite simple, follow the trick here. Look at eleven, there are two 1’s. Now for example you have 14 x 11. First do 14 x 1 = 14 then to this add 140 which is 14 + 140 = 154? Find the value of 456 x 11? This rule is applicable from 5 to 95 only (i.e., 5, 15, 25, 35, 45, 55, 65, 75, 65, 75, 85, 95.) and here is how it works! We have 5 x 5 = 25. The trick is, for a number ending in 5 when squared always has to end in 25. So for a given number example 152 pick the tens place, which is 1. Now the number after 1 is 2. Multiply 1 x 2 = 2. Now place a 25 next to 2. We get 225. Now for 25 x 25. Here, 2 is in the tens place. What is the number next to 2, 3. So do 2 x 3 = 6. Now place a 25 next to 6. We get, 25 x 25 = 625. Let us follow the diagram for clarity, take 65 x 65. Here is a quick mental math trick to find weather a given number is divisible by 2 or not just by looking at it. 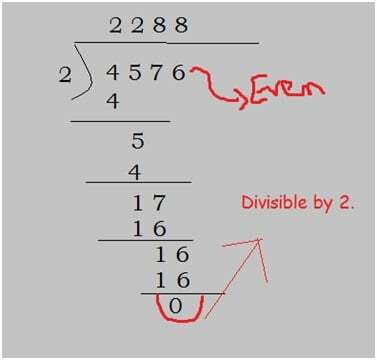 If a number is ending with an even number then it is divisible by 2. What are all the even numbers between 0 and 9 (0, 2, 4, 6, and 8). Look at an example: 48 here 8 is an even number so it is divisible by 2. Now 51 is not divisible by 2 as 1 is an odd number. Apply the same for big numbers. Find out if 4576 is divisible by 2? Prove it! 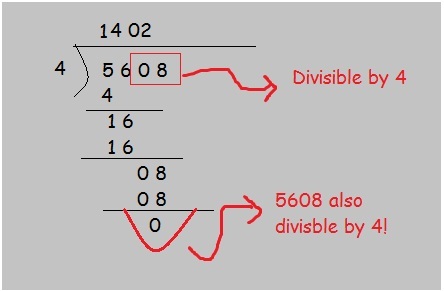 Find out whether 5608 is divisible by 4? Check your answer. Did your math calculations get faster on the divisibility part? 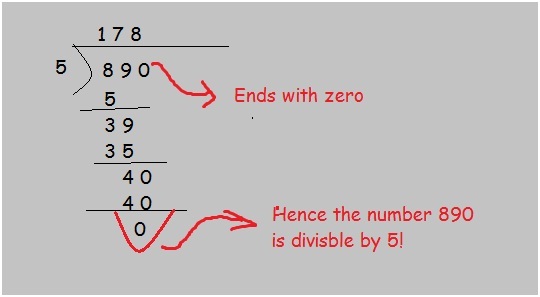 Now let us follow the trick for checking divisibility with number 5. For number 5, the given number should end either with 0 or 5. Take an example of 560 it is divisible by 5 since its ending in 0. Whereas 432 is not divisible by 5 since its ending with 2 not 0 or 5. Look at the following question. Find out if 890 is divisible by 5? Check your answer. Consider a question for finding 5x + 6x. A like term is a term which have the same variable. Here it is x. Now for adding 5x and 6x since x is the same, just find 5 + 6 = 11. Hence 5x + 6x = 11x. Find the value of 3x + 7x + 10x? Hence the solution is 20x. Therefore, practice these tricks and apply them in your math calculations. You will be amazed how they will aid in speeding your calculations. If you still need help, chat with a Live Math Tutor Online Now! Logarithms are really fun and interesting, but I have seen many students find changing logarithmic notation to exponential notation and vice versa quite confusing. Well here are some useful tips to make you remember that this conversion is simpler than you have expected. When you multiply 2 four times you get 16. That is 2 x 2 x 2 x 2 = 16. As show above, both the exponential notation and the logarithmic notation have the same base number. 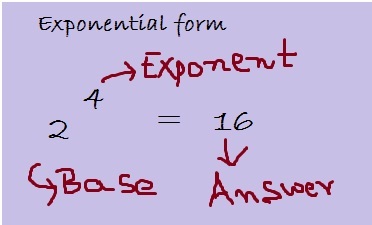 Next, there is an exchange in the exponent and answer while writing it in the logarithmic notation. Convert 34 = 81 from an exponential notation to logarithmic notation. Here 3 is the base number which will remain the same even in the logarithmic form. Convert 52 = 25 from exponential form to logarithmic form. Everyone likes the 5 times table, for some reason it’s quite easy to memorize. Taking a step further, let us now convert the logarithmic notation into exponential notation applying the same process backwards. Convert log4 64 = 3 from logarithmic notation to exponential notation. Hence the exponential notation for the given question is 43 = 64. Good so far! Now, have you ever observed some logarithms written without a base? For example, notations like log 5, log 16 or log 150. Are they really without any base number? The answer is NO! They have a base number which is 10 it’s called the common base. Convert the given exponential form 103 = 1000 to logarithmic form? Now you are familiar with the logarithmic notation and ready to change exponential notation into logarithmic notation. But remember logarithms does not stop here, these are just few useful tips to get you started with the logarithmic notation.